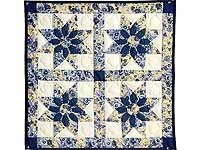 A cool little quilt to brighten that special niche! Wonderful fabrics, well made by local Amish woman. Includes tabs for a hanging rod. 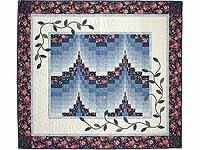 Great patchwork applique combination in lovely shades of Navy and blue. Note the care taken with the applique work and the quilting. Made here in Lancaster by an Amish woman. Includes tabs for a hanging rod. A terrific combination of album style applique with the classic log cabin. Note the care taken in selecting attractive lavender fabrics. Well made by local Amish woman. Includes a sleeve for a hanging rod. 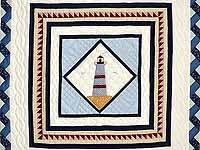 A super quilt for a sailor! 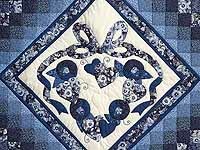 Note the sailboats in the quilting and the extra special border. 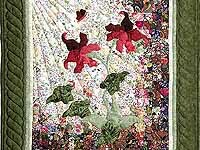 Perfect applique work, fine piecework and quilting. Made by local Amish woman. Includes sleeve for hanging rod. Very lovely coloring and great workmanship. Note the white on white butterfly print used for the sash -- delightful! Big enough to use as a throw or as a wall hanging over a sofa or bed. Made by a Lancaster Amish woman in her home. 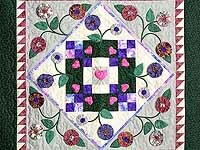 Superb combination of patchwork and applique work. The watercolor patchwork sets off the lily in almost a magical way. 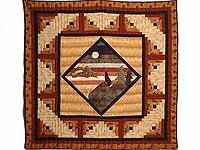 C Jean Horst designed this quilt and selected the fabrics. Well made. Original design, pattern not available. 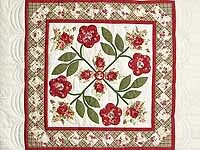 A gorgeous album style applique design surrounded with patchwork. Lovely coloring and fine workmanship. Made here in Lancaster by an Amish woman. Includes a sleeve for a hanging rod. Wow Yo Yo's! 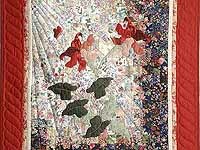 A very happy quilt with a design we have not seen before. Superb workmanship -- note the applique work and the amazing quilting. 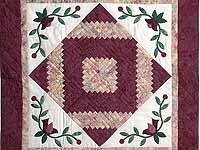 Made by one of Hannah's favorite Amish quilters. Includes a sleeve for a hanging rod.